Always Watching by Lynette Eason released this month from Revell. It’s the first in the author’s new Elite Guardians romantic suspense series. Available in electronic, paperback, large print, and audio editions. 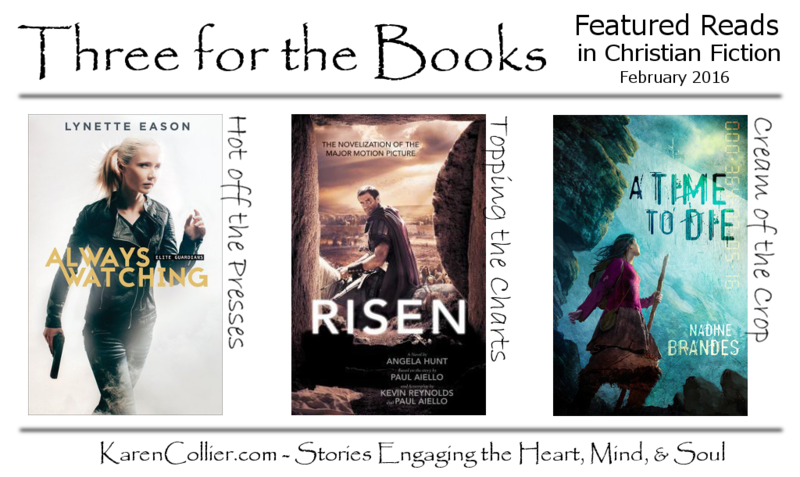 Risen by Angela Hunt appears on the ECPA’s February Christian Fiction Bestsellers list. It’s a novelization of a movie by the same name that’s coming to theaters this week (February 19, 2016). Here’s some background info about the book, that appeared on the publisher’s blog. The novelization from Bethany House is available in print, electronic, and audio editions. A Time to Die by Nadine Brandes won the 2015 Carol Award for Speculative Fiction. It’s first in the author’s Out of Time series, published by Enclave Publishing. Available in print and electronic editions. Check out my review to learn more. The Proposal is a pulse-pounding thriller about a rarely discussed women’s medical issue from one of America’s most prolific novelists. It begins with a foolish error. While attending a writers’ conference in Washington, D.C., Theodora Russell gets a call from an editor who wants to discuss her book proposal. During their meeting, however, Theo quickly discovers that the editor actually wanted to meet with Theodore Russell and talk about his book proposal. Before Theodora can correct the misunderstanding, she becomes intrigued by Theodore’s proposal. It’s for a book that links breast cancer with first-pregnancy abortions. Determined to do a very different treatment of the topic, Theo researches the link—only to wind up running for her life. Angela Hunt’s The Proposal discusses abortion and breast cancer, two emotionally charged subjects, and does it in the context of a gripping romantic suspense novel. It follows the main character, Theodora Russell, as she uncovers information regarding an alleged link between abortion and breast cancer for the book she wants to write, and in the process gets herself into hot water with the law and with powerful men backed by thugs. Because of the premise of the novel and the prominent role medical research plays in it, I couldn’t help but ask the question… is there actually a link between abortion and breast cancer? After doing some preliminary research (okay, a Google search and reading a few of the top results), I remain skeptical. I’m not convinced there is a link and I’m not convinced there isn’t. If this issue is one you feel passionately about or that affects you or a loved one personally, I would recommend doing some additional research of your own and/or consulting a medical professional before A) panicking, or B) telling all your friends, family, and social media contacts about it. Well researched as this novel may be, bear in mind that it is a work of fiction and that it was originally published in 1996, so it falls to the reader to evaluate where the lines between fact, fiction, and opinion fall, and how additional research studies in the intervening years may have impacted medical thinking on the subject. That said, this book certainly raises some interesting and controversial questions, which makes for some fascinating reading and sets up the suspenseful elements of the story perfectly. It could also make for a very interesting discussion if chosen by a book discussion group. Theo is a woman on a mission, determined to achieve her dream of supporting herself and her daughter through her writing, even as the financial reserves allowing her to pursue that dream are dwindling. She’s also passionate about doing what she believes to be the right thing, and spreading the word about an under-reported health issue she feels women need to know about. It’s easy to root for a character like that, even when she makes some foolish decisions that land her in a world of trouble, because you can see the motivation behind those choices. I thought Dr. Ken Holman was an interesting character in his own right, as well as the perfect romantic interest for Theo. I enjoyed watching their relationship develop over the course of the story and was highly entertained by the unexpected twist in their relationship near the story’s conclusion. I won’t spoil it for you. You’ll just have to read and find out for yourself. The plot kept the level of suspense high throughout the story as danger mounted, giving the story a brisk pace, despite delving into medical details on the issue Theo’s writing her book about. If there’d been pages, I’d have been hard pressed to stop turning them. As it was, I found myself listening to this audiobook any chance I could get – in the car, washing dishes, doing laundry, etc. Speaking of the audio edition, I felt that narrator Nora Funaro did a great job in her reading of this book. Her narration style is clear and well-enunciated, with variations in vocal range and speech patterns appropriate for the characters. I thoroughly enjoyed the listening experience and would not hesitate to recommend this edition to audiobook fans in search of a suspenseful read. Thank you to narrator Nora Funaro for providing me with a complimentary copy of this audiobook for review purposes. My review represents my own honest opinion.